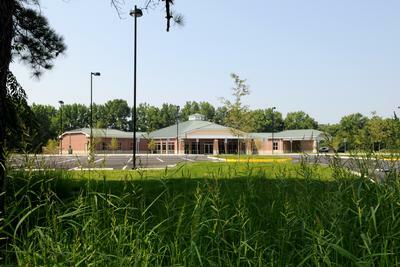 The Onley Community Health Center is the flagship prototype design for a series of rural community health facilities for the Eastern Shore Rural Health System, Inc. The 20,000 square foot building provides multi-discipline health care services for large sectors of Virginia’s historically underserved Eastern Shore, including its general population, seasonal migrant worker families, rural poor and corporate clients. The design program demanded innovative means to direct large volume daily patient flow efficiently, to visually track patient movements from a central vantage point, and to create visually appealing spaces which lessen trepidation by patients and families. The building houses 38 exam rooms, a central administrative core, clinical areas, labs, digital X-Ray, sterilization room, a large day-lighted north-facing waiting room with check-in stations, and staff support areas. The building footprint consists of spoke-like wings radiating from a central hub. The centralized administrative area has 360 degree access to the rest of the building. Each exam room wing corridor is fully visible from the common nurses’ station to ensure patient security and proper patient flow. Supportive wayfaring devices include color and number coded signage with Spanish language text equivalents, colored floor tile accents and matching color crash bars. The second in the series of prototype facilities, the Atlantic Community Health Center completed construction in 2013 and contains a state-of-the-art dental wing. The third facility, Eastville Community Health Center, is currently in progress. This building will also include a dental wing with the ability to make dentures on-site and one extra exam room per wing, bringing the total sf to approximately 24,000sf. This facility also includes a drive-through pharmacy.